Dolores Villareal, John Orr, Dave Ambrose, Matt Crichton, Ray Coffey. Acústica World Music CD. During the holidays my wife and I met a charming couple one morning at a bed-and-breakfast. Through the course of conversation we learned they were on their honeymoon, and they were musicians. At the time we knew they were a most-gracious and engaging pair. What we didn't know until we got home and listened to their present album was how good musicians they were. 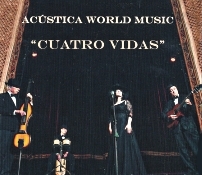 Their group is Acústica ("acoustics" or "sounds"), and the name of their disc is Cuatro Vidas ("Four Lives"). 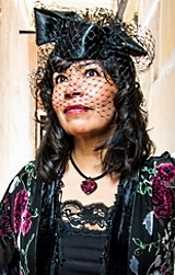 The members of the band represented on the album are Dolores Villareal, vocals; John Orr, guitar and vocals; Dave Ambrose, bass guitar; Matt Crichton, percussion; and Ray Coffey, guest saxophone and flute. The star of the show is Ms. Villareal, a multi-linguist singer, percussionist, and songwriter. Ms. Villareal sings in nine different languages, her most-recent Finnish. On the album's program she sings in Spanish, French, English, Portuguese, and Cape Verde creole. Her voice is lovely--sweet and tender one moment, big and powerful another. More important, she uses a good deal of flexibility and nuance to create a wide range of emotions in the songs. The accompanying players add their own special blend of enthusiasm, imagination, precision, and professionalism to the proceedings. On their own, they are fun to listen to; along with Ms. Villareal, they are even better. 3. "Sous Le Ciel de Paris"
7. "La Vie En Rose"
Favorites? Of course. Although I enjoyed all of the tracks, I especially enjoyed "Piel Canela" for its pervasive zest; "Sous le ciel de Paris" for its buoyant romanticism; the title song for its fluidly engaging lyricism; and, well, they all sounded good to me. A most-entertaining album. Are there any drawbacks I could find? The only one I can think of is the usual one I find in pop and jazz programs: It's too short. I suppose I've just become used to classical albums providing something close to a CD's near eighty-minute limit, and this one gives us something more like half that playing time. Oh, well. As they say, it's the quality, not the quantity that counts. Dave Gager of Bentrabbit Multimedia Studios and Dolores Villareal produced, recorded, engineered, and mastered the album for Acústica World Music in 2013. The sound is up close, as most popular albums tend to be. It provides good detail, though, and here we get no brightness or edginess, just a smooth, natural response. There is also a mild studio bloom that provides a realistic ambience for the group, and Ms. Villareal's voice sounds sweetly lifelike. While there is not a lot of air or depth to the sonics, there is a good, wide dynamic range and strong, quick impact, so we get a pleasantly listenable album. Amazon sells the songs for individual download but, oddly, not the CD. You'll find that at Acustica World Music: http://www.acusticaworldmusic.com/. 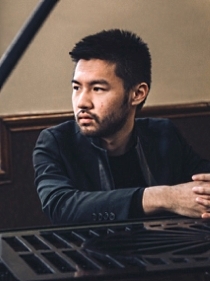 Noteflight (noteflight.com) will present acclaimed pianist/composer Conrad Tao in a groundbreaking new kind of live masterclass. Conrad will use Noteflight's cloud-based, collaborative notation software to explain the compositional process and musical ideas behind his piece A Walk (for Emilio). The event will present the live score of the work side-by-side with a video of Conrad himself, and will incorporate questions from Noteflight's vibrant community of almost 2 million music enthusiasts. The masterclass will offer insight into how Conrad conceived and created his new solo piano piece A Walk (for Emilio), written as part of his new Warner Classics album Pictures and recalling one of his earliest piano teachers, Emilio del Rosario, who died in 2010. He says of the work: "I sometimes imagine spending time with 'Mr. D' today. I imagine the two of us sharing the various things we've both done since I moved away; I imagine the two of us talking about music as we always did. A Walk (for Emilio) is about those imagined memories. It alternates between ambling, freely lyrical passages and anxious, pleading, yearning chords." Following the event, Conrad will moderate a dedicated forum on the site where users can follow-up on the event and present their own scores for constructive feedback. The uniquely collaborative nature of Noteflight's technology will allow for an unprecedented level of direct interaction between Conrad and Noteflight users. Said Noteflight President Joe Berkovitz of the event: "Noteflight is thrilled and honored to be working with Conrad Tao to offer this event. Our service is all about sharing, collaboration, and learning. Using Noteflight to bring artists like Conrad together with our members feels like something that was simply meant to happen." Organists are often hidden away in the rear of the church, or tucked off to the side behind the choir. Most churchgoers or audiences have only a rudimentary understanding of what the organist actually does, or the sheer amount of work that goes into preparing and performing each piece. Sacred Music in Sacred Space's N.P. Mander Organ Recital Series works to put the organist front and center by showcasing the extraordinary talent of some of the finest organists on one of the stateliest instruments in the United States. At each recital, through the use of a large-screen projection, the audience gets to witness firsthand the organist at work, a rare treat for those used to organists being "out of sight and out of mind." On February 21, 2016, at 3:00 pm, K. Scott Warren, Director of Music Ministries at New York's majestic Church of St. Ignatius Loyola and Artistic Director of Sacred Music in a Sacred Space concerts continues the grand tradition of the Mander Organ Recital Series. Unfortunately due to a recent injury, Organist Emerita of the Church of St. Ignatius Loyola Nancianne Parrella, who was to join Mr. Warren for this performance, will be unable to participate. Join "America's favorite mezzo," opera star Susan Graham, Nicholas McGegan and the Philharmonia Baroque Orchestra for a lively afternoon of music on February 14. Treat yourself and your date to a free glass of J Cuvée sparkling wine in the lobby and make this a Valentine's Day to remember. Use promo code VDAY at checkout to unlock this special offer. The Metropolitan Opera National Council Auditions Program awarded prizes to New England Conservatory students, GyuYeon Shim and Erica Pertrocelli. Held annually, the New England auditions are located in Jordan Hall. The Metropolitan Opera National Council Auditions Program aims to discover exceptional young opera talent, provide the opportunity for gifted young opera singers at all levels of development to be heard by representatives of the Metropolitan Opera, and to assist those with the greatest potential for operatic careers. This year's judges were Gayletha Nichols, Executive Director of the National Council Auditions; James Robinson, Artistic Director of the Opera Theatre of St. Louis; and Nicholas Russell, Director of Operations for Boston Lyric Opera. GyuYeon Shim, a 27-year-old soprano from Seoul, South Korea won the third prize and a monetary award of $4,000. She most recently sang the role of Nella in NEC's production of Puccini's Gianni Schicchi on December 13, 2015 and is anticipated to graduate from NEC in 2017 with a Graduate Diploma degree studies. Shim studies with Lorraine Nubar at the Conservatory. She received her Bachelor of Music in Vocal Performance from the Korea National University of Arts and her Master of Music in Vocal Performance from the Manhattan School of Music. Erica Petrocelli, a 23-year-old soprano from Providence, Rhode Island won an "Encouragement Award" and a monetary prize of $2,000. Petrocelli was cast in the title role of Bystrouska (Vixen) in NEC's upcoming production of Janaceck's The Cunning Little Vixen. She will appear in the Sunday, February 7, 2016 and Tuesday, February 9, 2016 performances at the Cutler Majestic Theatre. Petrocelli received a Bachelor of Music in Vocal Performance from NEC and is continuing at NEC in the Master of Music program, which she anticipates completing this year. She will be performing her graduation recital in Brown Hall on Friday, February 26, 2016 at 8:30pm. "Uneasy Listening: An Evening with Clint Mansell" promises to be a breath-taking performance of film music from the acclaimed British composer – the man behind some of the most celebrated soundtracks of the past two decades. Longtime collaborator of groundbreaking director Darren Aronofsky – for whom he scored Black Swan, Requiem For a Dream, The Fountain, The Wrestler, Noah, and Pi – Mansell has been recognized for his outstanding work with Grammy and Golden Globe nominations, and critical acclaim. In addition to his work on Aronofsky's films, Clint is the man behind the music for Duncan Jones's directorial debut Moon, Jon S Baird's Filth, and Park Chan-Wook's Stoker. Most recently he has completed the score for Ben Wheatley's High Rise, which premiered at the Toronto International Film Festival and is due for release in early 2016. Clint plays in L.A., at The Theatre at The Ace Hotel (previously playing a 3 night residency at Largo, and a show at The Orpheum) – and 4 shows in the UK, including his largest London show to date, and his first 'home coming' show in the midlands. Mansell will perform works from his scores, with his band (Mike Fonte, Clint Walsh & Eric Gardner), alongside pianist Carly Paradis and Sonus Quartet (Vanessa Freebairn-Smith, Kathleen Sloan, Jennifer Takamatsu & Rob Brophy). Leading a movement to reboot mainstream classical music, The Ear returns, following its boisterous debut in October. Provoking an alternative to frequently-alienating "new music," The Ear is a concert, a rowdy night out, and a competition for mainstream classical composers. The brainchild of composer Alf Bishai, The Ear asks audiences the simple question: Do you want to hear it again? The second edition of The Ear takes place on Monday, February 29 at 7:00 pm at Le Poisson Rouge, the multimedia art venue with food and drink, in Greenwich Village, New York City. "I've been obsessed with understanding the absurdities, prejudices and self-defeating practices of classical music culture, and with figuring out how we may be rid of them," says Bishai, a composer, music director, and music theory teacher at NYU. "The Ear is the fruit of a decade of thinking, arguing, writing, wrangling, experimenting, and searching for kindred spirits." Steadily attracting like-minded musicians, The Ear currently counts over 600 composers in its network. The aim? To produce infectious, jaw-droppingly gorgeous, new classical hits. At The Ear, seven new short works for solo piano will be performed. After each piece, the audience answers the question: Do you want to hear it again? If half vote yes, the piece moves forward. At the end of the evening, the yeses are encored and, after a vote, the winner is declared and takes home $2,000. At The Ear's launch event in October, the audience encored 7 out of 9 pieces. "After each piece, people exchanged thoughts and reactions; strangers were having fun conversations about high art!," says Bishai, also the emcee, "People were bantering with me on stage, cheering, booing, heckling. The Ear is a glorious, beautiful, human mess, and great art is going to be born here." Also, Les Preludes; Mazeppa; Battle of the Huns; Mephisto Waltz No. 1. Hermann Scherchen, Vienna State Opera Orchestra. Westminster Legacy 289 471 237-2 (2-disc set). For those of you old enough to remember the original Westminster label, it was one of the most "major" of the minor record companies and produced classical LPs from the early Fifties to the mid Sixties. At various times ABC, MCA, and most recently DG owned or distributed the recordings themselves, and one could also often find them under the "Music Guild" appellation. Anyway, in the early 2000's they began reappearing again on the original Westminster label, and I found a few of their reissues quite welcome, like this one. Hermann Scherchen, one of the old Westminster company's biggest stars, conducts the present release, and it features Westminster's famous "natural balance" sound. 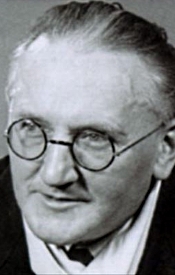 Scherchen (1881-1966) could hold his own with any modern interpreter, and given the age of the recordings, 1958-1960, they, too, sound remarkably good. Here, Scherchen is leading the Vienna State Opera Orchestra, which included mainly members of the Vienna Philharmonic, so there's not a lot of doubt about the quality of the music making, even though the Opera Orchestra doesn't sound as luxuriously polished as the Philharmonic, and intonation doesn't appear as solid. Who knows. While Scherchen could occasionally be overly enthusiastic in his conducting, even leaning to eccentricity at times, here he eschews too much bombast, something these Liszt works can easily succumb to, the conductor handling some of the showier sections with a pleasing refinement and nuance. The Rhapsodies, which appear to be mainly Liszt's own orchestrations of his piano works rather than some of the more popular reworkings, don't always come off as glamorously or dynamically as, say, Dorati's (Mercury), Boskovsky's (EMI), or Stokowski's (JVC or RCA), but Scherchen skillfully manages each piece, providing them with plenty of reserved flair and inner feeling. OK, to be fair, maybe he's too cultured in these pieces for some tastes, but, whatever. Les Preludes, Mazeppa, and the Battle of the Huns on the other hand, sound as powerful as they come, so I suppose that makes up for a little less drama earlier. Then, oddly, the Mephisto Waltz appears to drag a bit. Go figure. What's important is that each listener will have his or her own personal likes and dislikes. The remastered sound from 2001, using a process called "Original Image-Bit Processing," is fine and captures the natural quality of the music making. There is, however, a fair degree of background noise on some of the 1958 recordings, especially, tape hiss and miscellaneous soft thumps and gurgles. It's not enough of a distraction to put one off the music, but it is present, nonetheless, so I thought I'd mention it. Otherwise, the sound is very slightly soft and a tad rough, but it is extremely well imaged left to right, with a reasonable amount of detail and orchestral depth. 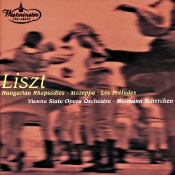 Offered at a low price, this two-disc set seems a safe bet for the Liszt lover. Also, L'Arlesienne Suites 1 & 2. 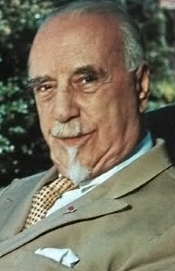 Sir Thomas Beecham, Orchestre National de la Radiodiffusion Francaise and Royal Philharmonic Orchestra. Warner Classics 0724356723122. You've heard me ask this before, I'm sure, but it bears repeating: Who would you rather have conducting French orchestral music more than Sir Thomas Beecham? I can think of no one. Whether it's Bizet or Berlioz or Franck or Debussy or Delibes or Faure or Saint-Saens or Massenet or Chabrier or whomever, Sir Thomas's name stands out a leading contender for best conductor of French music. Not that he didn't do well conducting other music, especially English pastoral music, but he seemed to have a special affinity for French music. The Bizet Symphony in C and L'Arlesienne album under review is a good example: Recorded in 1956 and 1959 by EMI, remastered by EMI in 2000 for their "Great Recordings of the Century" series, and rereleased by Warner Classics in 2015, it remains the one to beat in this repertoire. Anyway, the Symphony in C is a composition French composer Georges Bizet (1838-1875) wrote as a student exercise at the age of seventeen. It's a remarkable work for any age, but doubly so given the composer's youth. What's more, it's held up well, considering that Bizet thought so little of it that he filed it away and forgot about it. It lay undiscovered in the Paris Conservatoire archives for some eighty years until Bizet biographer D.C. Parker found it, the work receiving its première in 1935. Over the years there have been any number of fine recordings made of the Symphony in C, ones from the stereo era including those of Marriner and the Academy (Decca), Bernstein and the NYPO (Sony), Ansermet and the Suisse Romande O. (Decca), Barenboim and the Paris Orchestra (EMI), Plasson and the Toulouse Orchestra (EMI), Pretre and the Stuttgart Radio Symphony Orchestra (Hanssler Classics), West and the San Francisco Ballet Orchestra (Reference Recordings), among others. But, as I said before, none of them have really topped the performance of Sir Thomas Beecham and the French National Radio Orchestra. Beecham's performance possesses all the drive, energy, dazzling radiance, and youthful charm (though the conductor was nearing the end of his life when he recorded it) one could possibly want from this symphony. There is never a lag or a lull in the music, yet Beecham never overdrives it, either; it simply sounds "right" at all times. Thus, an Allegro vivo really does exhibit a brisk, lively manner, with more than a hint of impish enthusiasm added. The Adagio moves at a comfortable, leisurely, rhythmic, but not at all sluggish pace. The scherzo is elegant as well as energetic; and the finale is as playful and exciting as any you'll hear. When Bizet wrote his incidental music to Andre Daudet's play L'Arlesienne (The Girl from Arles) in 1872, the public and critics thought it a distraction from the rest of the production. More likely, the music was probably better than the drama (which I haven't seen) and simply upstaged it. Whatever the case, neither the play nor the complete incidental music has fared all that well since then. However, the wily Bizet recognized a good thing when he heard it and extracted a suite from the work (and his friend Ernest Guiraud orchestrated a second suite after the composer's death, one that adds a little minuet from La jolle fille de Perth). These suites, of course, have gone on to become the classics that many of us prize in our collections. 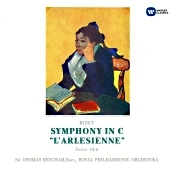 As with the Symphony in C, no one in my experience has conducted the L'Arlesienne music any better than Sir Thomas. He dispatches every movement of these two suites with characteristic humor, refinement, and swagger, as the situation demands. And the orchestra plays with an assured air of authority, as though they knew that no one would ever match them in these performances. No one ever has, really. Producers Victor Olof and Lawrence Collingwood and engineers Paul Vavasseur and Douglas Larter recorded the music at Salle Wagram, Paris, 1959 (Symphony) and Abbey Road Studio No. 2, London, 1956 (L'Arlesienne). You'd never know it. The clarity and cleanness of the recordings continue to sound impressive. In the Symphony, the sound displays good detail, a natural room resonance, a smooth overall response, and decent orchestral depth. You would not think this a sixty-odd-year recording, particularly as the remastering engineers have so well removed any background noise from the master tape. In the L'Arlesienne suites, recorded a few years earlier in London, the sound is very similar to the later production. It's realistically warm, with a pleasant ambient glow, if maybe a touch rougher, less wide, and less clear. Still, early stereo or not, it holds up about as well as most of today's recordings. 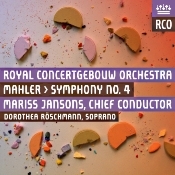 Dorothea Roschmann, soprano; Mariss Jansons, Royal Concertgebouw Orchestra. RCO Live RCO15004. This disc interested me not because I thought the world needed yet another recording of the Mahler Fourth Symphony (I mean, we only have about 800 of them already, and one can never have enough) but because I was curious about the newly recorded sound. The Concertgebouw hall and orchestra have long been among my favorite venues and ensembles, and I wondered if they sounded as good as ever, especially as this new release sports a live SACD recording. Is the latest up-the-minute digital technology any better than what we've heard in the past? The answer is a resounding "Who knows?" (Or for non-audiophile types, "Who cares?") The performance and sound are both up to snuff, and certainly the orchestra remains among the most glorious in the world. Yet, do they sound any better than what we already have? Not really. As I'm sure you know, the Austrian composer and conductor Gustav Mahler (1860-1911) premiered his Symphony No. 4 in C Major in 1901, but not everybody liked it. Today, however, it's probably Mahler's most popular work. Modern audiences seem to find it accessible, tuneful, and mature. Then, too, while the music is big scale, it also feels quite intimate, and listeners appreciate the music's contrasts going from grand, eloquent sections to quiet, personal ones, from deadly serious passages to mischievously satiric ones. In other words, it has a lot to offer, particularly to audiophiles because the piece uses a huge orchestra, with plenty of room to show off one's playback system. Anyway, Mahler appears to have intended his Fourth Symphony as something more than absolute, nonrepresentational music, and even though he didn't leave a detailed program for it, he did leave enough specific directions for each movement to give people an idea of what the music was all about. One of the composer's followers, conductor Bruno Walter, said of the symphony: "In the Fourth, a joyous dream of happiness and of eternal life promises him, and us also, that we have been saved." Mahler marks the first movement as "gay, deliberate, and leisurely," and he begins it playfully with the jingling of sleigh bells, an effect that also provides a positive sign of youthful hope. In the second movement, Mahler introduces Death, using a vaguely sinister violin motif. He marks the slow, third-movement Adagio as "peacefully," and it is a kind of respite from the oddities of Mr. Death in the preceding section. In the fourth and final movement, Mahler gives us his vision of heaven and salvation as exemplified by the simple innocence of an old Bavarian folk song, a part of the German folk-poem collection Das Knaben Wunderhorn that Mahler loved. Here, the composer wanted the movement to sound so unaffected he insisted upon a soprano's part sung with "child-like bright expression, always without parody." So, how does Maestro Mariss Jansons and his Royal Concertgebouw Orchestra handle all of this? Pretty well, if a little overly fussy for my taste. Jansons maintains a steady, fairly well judged tempo throughout the first movement, although he doesn't seem quite as smoothly flowing as the conductors of several other favorites of mine, including Bernard Haitink (Philips), George Szell (HDTT or Sony), Fritz Reiner (JVC or RCA), Otto Klemperer (EMI), Lorin Maazel (Sony), Herbert von Karajan (DG), Antoni Wit (Naxos), Simon Rattle (EMI), and Klaus Tennstedt (EMI), to name a few. Jansons seems to emphasize the contrasts more than other conductors and linger momentarily over some points while scurrying through others. It's not at all distracting or disconcerting, just a little more fastidious than probably necessary. In the second movement Jansons tends to be a tad more perfunctory than Mahler probably meant a conductor to be. He seems not to delight so much in the eccentricities of the music but rather gloss over them. Of course, that's just the impression I get, and other listeners will no doubt appreciate the maestro's nuanced approach to the middle section in particular. The Adagio is hauntingly beautiful, and unlike a few conductors who take it so slowly it loses any sense of forward momentum, Jansons keeps the music light and refreshing. It's a lovely interlude. Dorothea Roschmann's contribution to the finale didn't quite work for me. Although she projects a fine soprano voice, it doesn't exactly display all the childlike qualities I associate with this part. Nor is the conductor's rather insistent accompaniment as sublime as I'd have preferred. Nevertheless, the whole project comes across efficiently, and my qualms are minor. Besides, it's hard to argue with the splendid playing of the Concertgebouw Orchestra. They make everything sound good. Producer and engineer Everett Porter made the 96 kHz recording live at the Concertgebouw, Amsterdam in February 2015, recording the music for hybrid 5-channel/2-channel SACD/CD playback. I listened to the 2-channel SACD layer. However, before listening to this live recording, I listened to a few minutes of one of my favorite Mahler Fourths, the 1983 Philips digital release with Bernard Haitink, Roberta Alexander, and this very same Concertgebouw Orchestra. Obviously, I was curious to see what differences there might be in the sound after some thirty-two years of audio evolution. What I found was that there wasn't a whole lot of improvement in sound, despite the SACD processing. Whereas the older recording sounds warm, ambient, spacious, and rich, the newer one is closer and slightly harder, with less of a feeling for the venue. Still, the SACD sound is dynamic and well detailed, with a modest sense of orchestral depth (though no match for the older recording in this regard). Fortunately, it isn't as bright or forward as many live recordings, and it retains a touch of warmth. While I could have done without the occasional grunts and heavy breathing of the audience, at least the engineers save us the grief of any closing applause, and the music's final note fades smoothly and quietly into the distance. Incidental note: Either by accident or by intent, RCO Live omit any identification of the symphony from the disc itself. The SACD bears only the words "RCO Live" on it; no symphony number, no conductor or orchestra; no record number. I suggest owners of the disc keep it safely in its case when not in the player, or one could easily lose track of what it is. Of course, a marking pen might also help, but who wants to deface a disc? SDG Music Foundation's 2016 Chicago Bach Project concert will feature J. S. Bach's monumental Mass in B Minor, BWV 232, with Grammy Award-winner John Nelson conducting an all-new cast of soloists and the Chicago Bach Choir and Orchestra. The one-night-only performance will be at 7:30 p.m. on Friday, March 11, 2016, at the Harris Theater at Millennium Park in downtown Chicago, Il. Mass in B Minor soloists will include soprano Kathryn Lewek, mezzo-soprano Margaret Lattimore, tenor John McVeigh, and bass-baritone Daniel Okulitch. Prior to the Mass in B Minor performance, the choir under chorus master Donald Nally will give the U.S. premiere of Laudate, commissioned by SDG Music Foundation for its Psalms Project. The contemplative a cappella choral work, set in Latin, was composed by John Metcalf, founder and artistic director of the Vale of Glamorgan Festival in Wales. Now in its sixth season, the Chicago Bach Project has staged world-class productions of one of J. S. Bach's towering sacred masterworks each spring since 2011. The rotating cycle launched with a sold-out performance of the St. Matthew Passion conducted by Nelson, who is SDG's founding artistic director. Nelson also conducted the project's 2012 St. John Passion, 2013 Mass in B Minor, 2014 St. Matthew Passion, and 2015 St. John Passion. The 2016 performance returns to Bach's final crowning achievement, the Mass in B Minor, which many consider the greatest composition in Western classical music. Although completed in 1749, the work was never performed in its entirety during the composer's lifetime and did not receive its first full performance until over 100 years later in 1859. The work moves far beyond its liturgical origins in scale and offers some of Bach's most profound and beautiful music. Free Pre-Concert Events March 1 and 7. Conductor Nelson will offer "A Bach Briefing" from 5:30–6:45 pm. on Monday, March 7. Nelson will demonstrate themes from the Mass in B Minor at the piano and offer insights into Bach's work. While both events are free to the general public, seating is limited. Pre-registration is required by e-mailing sdg@sdgmusic.org or phoning (630) 983-4300, ext. 400. Single ticket prices for the Mass in B Minor concert are $25 to $55. Tickets are available online at HarrisTheaterChicago.org, by phone at (312) 334-7777, or in person at the Harris Theater Box Office, 205 E. Randolph Drive, Chicago, IL 60201. A product of the same musical culture that produced internationally renowned conductor Gustavo Dudamel, and pianist Gabriela Montero, Vanessa Perez is undoubtedly a rising star in her own right. Perez brings her bold, energetic pianism to works by Manuel de Falla and Claude Debussy at the Americas Society (680 Park Avenue, NYC) on January 28 at 7pm. The program is inspired by Perez's latest album for the Steinway & Sons label, "Spain," which showcases her artistic sensitivity and acute awareness of unexpected connections between composers and musical styles. Admission to the concert is $20 general admission and free for AS/COA members; $10 tickets will be available at the door for students and seniors. Perez made her Carnegie Hall debut in 2004, but as a testament to her versatility, her first New York performance wasn't in an uptown classical concert hall – it was at the downtown jazz shrine of the Blue Note, where Latin jazz star Arturo Sandoval had her perform his Sureña, a piece laced with Venezuelan folk melodies. New Century Chamber Orchestra announced that Music Director Nadja Salerno-Sonnenberg will step down from her role as Music Director following the 25th anniversary season in 2016-2017. Appointed in September 2008, Ms. Salerno-Sonnenberg led New Century through an exciting period of growth over the course of eight highly successful seasons. Through her leadership, the orchestra founded a Featured Composer program, commissioning a total of eight new works and expanding the string orchestra repertoire; embarked upon three extensive national tours garnering record-breaking audiences and national critical acclaim; recorded three live recordings on Nadja's own NSS music label; cultivated vibrant partnerships with some of the Bay Area's most celebrated arts organizations such as the San Francisco Opera, San Francisco Girls Chorus and Chanticleer; and further enhanced the orchestra's national footprint through a rapidly increased national radio presence. "The impact of Nadja's tenure as Music Director is incalculable and her achievements are many," said President of the Board of Directors Mark Salkind. "After nearly a decade of extraordinary leadership, New Century has risen to a new height of artistic excellence and acclaim. Thanks to her hard work and dedication, we are confident that our search for a successor will attract an illustrious pool of candidates." As one of the leading violinists of her generation, Salerno-Sonnenberg's career began when she won the 1981 Walter W. Naumburg International Violin Competition which she followed up two years later with an Avery Fisher Career Grant and later in 1999 the prestigious Avery Fisher Prize. A powerful and creative presence on the recording scene, Nadja has released over 20 recordings on EMI and Nonesuch labels as well as working with an extensive roster of musicians on her own NSS label including her most recent New Century release "From A to Z" (May 2014) featuring commissioned works by Clarice Assad, William Bolcom, Michael Daugherty and Ellen Taaffe Zwilich. A recipient of full scholarships to Yale and the Heifetz International Music Institute, 27-year-old cellist Chang Pan will perform his Carnegie Hall debut recital in New York with pianist Ronaldo Rolim on Wednesday, February 3 at 8:00 PM at Weill Recital Hall. Presented by esteemed Yale School of Music Professor Aldo Parisot, Mr. Pan's program includes Manuel de Falla's popular Suite Española, César Franck's Sonata for Violin and Piano in A major, Edvard Grieg's Sonata for Piano and Cello in A minor, Op. 36 and Wentao Jiang/Ling Cao's Festival Tianshan. Admission: $25, $20 for students and seniors. Tickets on sale at www.carnegiehall.org, CarnegieCharge at 212-247-7800, and at the Carnegie Hall Box Office. PBO SESSIONS: "Mozart's Piano," Thursday, February 4, 8 PM at the ODC Theater in San Francisco's Mission District. Mozart selections from Concerto for Fortepiano No. 23 in A major. Keyboard master Kristian Bezuidenhout will hold you captive as he demonstrates what Mozart intended you to hear when composing some of the best music of all time, on a replica of Mozart's piano. Hosted by KDFC's Hoyt Smith, PBO Music Director Nicholas McGegan and Kristian will discuss Mozart's Concerto No. 23 as one of his most popular piano concertos. Then Nic and the full orchestra will accompany Kris in a performance of the entire work. Following the concert, stick around to meet Nic, Kris, Hoyt and the orchestra and enjoy a glass of complimentary wine provided by WineWise. Award-winning cellist Zuill Bailey joins the National Philharmonic, led by Music Director and Conductor Piotr Gajewski, in a performance of two concertos by the Baroque master Antonio Vivaldi on Saturday, February 20 at 8 pm and on Sunday, February 21 at 3 pm at the Music Center at Strathmore. Bailey also performs Gregor Piatigorsky's brilliant Variations on a Paganini Theme. The concert also features two choral works--Beethoven's Elegischer Gesang (Elegiac Song) and Vivaldi's Gloria. A free pre-concert lecture will be offered in the Concert Hall at 6:45 p.m. on Saturday and at 1:45 pm on Sunday. Tickets start at $29 and are free for young people 7-17 through the ALL KIDS, ALL FREE, ALL THE TIME program. ALL KIDS tickets must be reserved by calling (301-581-5100) or visiting the Strathmore Box Office. Parking is complimentary. Strathmore is located at 5301 Tuckerman Lane, North Bethesda, MD 20852. For more information or to purchase tickets, visit nationalphilharmonic.org or call 301-581-5100. Widely praised for their continuing efforts to redefine the repertoire for percussion ensemble, Third Coast Percussion brings an exciting new work by Irish composer Donnacha Dennehy to New York City. 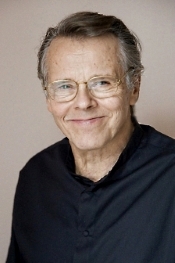 Dennehy's work, Surface Tension, was written expressly for the Metropolitan Museum of Art's extensive collection of historic percussion instruments. In this new piece, inspired by the playing techniques associated with the Irish bodhrán drum, the performers surround the audience with a battery of over 40 drums tuned using a special technique designed expressly for this piece. Surface Tension was commissioned by the University of Notre Dame's DeBartolo Performing Arts Center and the Metropolitan Museum of Art and is dedicated to Third Coast Percussion. Also on the program is Steve Reich's Sextet, a seminal work for percussion ensemble that is included on Third Coast's latest album, "Third Coast Percussion / Steve Reich." 2016 marks Reich's 80th birthday and this album pays tribute to the profound impact the composer has had on contemporary music and on the ensemble's members. 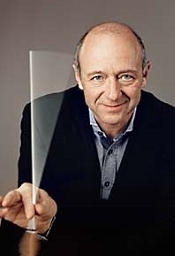 Of Reich's influence, Third Coast's Robert Dillon says: "While most composers now welcome our instruments on the concert stage, only a few have shown audiences how percussion can be absolutely essential. The rhythmic drive, articulated melody, and perpetual cycle of Reich's music seems to have marimbas and vibraphones in its very DNA." Members of Third Coast Percussion will join Dennehy and curators from the Met's musical instrument collection on Sunday, January 24 at 3pm for a free discussion about the creation of this one-of-a-kind work. Anthony Halstead, the Hanover Band. CPO 999 628-2. The Symphonie Concertante genre may remind some people of the form's predecessor, the Concerto Grosso, or the form's successor, today's Concerto. But, in fact, it differs from both. It is somewhat lighter in weight and tone than the former and does not emphasize individual instruments as much as the latter. Listeners of the day (as well as modern listeners) considered Johann Christian Bach (1735-1782), who was one of the multitudinous children of Johann Sebastian (actually, the eleventh surviving and youngest child of J.S. ), the leading exponent in the field, and this 2001 release from Anthony Halstead features three such works--the Symphonies Concertantes in C major, CW C36a; D major, CW C39; and Noturno in E-flat major, CW C40--all composed probably some time in the late 1760's (the manuscripts, only one of which is in Bach's own hand, bear no dates). Bach scored the first Concertante on the program with the emphasis on two violins and cello; the second with the emphasis on two flutes, two violins, and cello; and the third with the emphasis on two oboes, two horns, two violins, two violas, and cello. You can see from these descriptions that they hardly have time for more than passing concentration on any single instrument. Yet they are charming through and through, most particularly the first movement of the C major work, and they certainly deserve the attention they got from CPO. 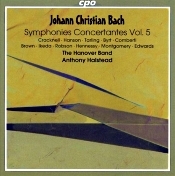 This fifth volume in a series of six was, I believe, the fourth CPO recording I had reviewed of J.C. Bach played by Anthony Halstead and his period-instrument Hanover Band; and it was possibly the fourth or fifth I had listened to over the years. It seemed as though each time I heard a new one from Halstead, I liked it better than the last. The sound continued to appear smooth and natural, the acoustic realistic, and the playing delightfully elegant and polished. Not only do the Hanover Band performances sound refined, so do the various soloists in the works: Andrew Byrt (viola), Robert Montgomery (French horn), Judith Tarling (viola), Gavin Edwards (French horn), Graham Cracknell (violin), Gail Hennessy (oboe), Anthony Robson (oboe), Sebastian Comberti (cello), and Peter Hanson (violin). It's an impressive team. If any of Halstead's previous work in this area impressed you, you can feel safe with this one as well. It is among the best of the bunch. Philharmonia Baroque Orchestra & Chorale (PBO) and KDFC are pleased to announce the next installment of PBO SESSIONS featuring "Mozart's Piano" on Thursday, February 4 at the ODC Theater in San Francisco's Mission District with international keyboard star Kristian Bezuidenhout and Music Director Nicholas McGegan. The two will present one of Mozart's most popular concertos in an entirely new and exciting way. PBO SESSIONS made its debut in February 2014 to consistently sold-out houses. These 90-minute interactive performances are designed to take audiences on a guided tour of classical music in informal settings, with multimedia presentations and dynamic dialogue from the stage. PBO SESSIONS concerts are led by Music Director Nicholas McGegan or guest conductors sharing historical anecdotes about the composers, the pieces, the period in which the music was created, and how the music is still relevant today. The audience is treated to musical demonstrations in historical context that deepens understanding of classical music in a relaxed atmosphere. Following the concerts, audiences always enjoy free wine and mingling with musicians. 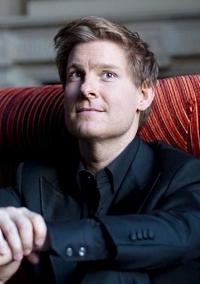 PBO SESSIONS: Mozart's Piano will feature the young and internationally renowned keyboardist Kristian Bezuidenhout who will join PBO music director Nicholas McGegan in an exploration of Mozart's Concerto for Fortepiano No. 23 in A major. Bezuidenhout will demonstrate what Mozart intended you to hear when composing this work utilizing a replica of Mozart's piano. Following discussion about this beloved concerto hosted by KDFC's Hoyt Smith, McGegan and the full orchestra will accompany Bezuidenhout in a performance of the entire work. Century continues its 2015-2016 season February 4-7 with debut performances by British violinist Daniel Hope. Making his first appearance in the Bay Area since 2011, Hope leads New Century as guest concertmaster and soloist in an eclectic program of works dedicated to his mentor and friend, Yehudi Menuhin. These performances also mark the official release of Hope's new Deutsche Grammophon album My Tribute to Yehudi Menuhin. Daniel Hope grew up within the Menuhin household and went on to partner with Yehudi in more than sixty performances. New Century's concerts coincide with the master violinist's centennial year and are hosted in the place where Menuhin made his first public appearance at aged seven with the San Francisco Symphony. Highlighting a number of works from his new album and celebrating the diversity of Menuhin's musical tastes, Hope appears as soloist in three violin concertos: J.S Bach's Concerto in D minor for two violins, BWV 1043, Vivaldi's Concerto in A minor for two violins, RV 522 and Mendelssohn's Concerto in D minor. Juxtaposing this are a selection of contemporary works including Arvo Pärt's "Darf Ich…," Philip Glass's Echorus, Bechara El-Khoury's Unfinished Journey, Toru Takemitsu's Nostalgia, and Béla Bartók's Six Romanian Folk Dances. "Hope for Menuhin" will be given on four evenings in different locations around the Bay Area: Thursday, February 4 at 8 p.m., First Congregational Church, Berkeley, Friday, February 5 at 8 p.m., First United Methodist Church, Palo Alto, Saturday, February 6 at 8 p.m., Herbst Theatre, San Francisco and Sunday, February 6 at 5 p.m., Osher Marin JCC, San Rafael. New Century offers an Open Rehearsal Wednesday, February 3 at 10 a.m., Kanbar Performing Arts Center, San Francisco for a price of only $15. The Open Rehearsal will offer a sneak preview of the concert repertoire while allowing audiences to experience the musical democracy of a rehearsal without a conductor. Third Coast Percussion kicks off 2016 with several exciting efforts, including the release of their eagerly-awaited new album, Third Coast Percussion | Steve Reich, on February 12, 2016 (Cedille Records). The album features works by Pulitzer Prize-winning composer Steve Reich, whom The Village Voice deemed, "America's greatest living composer." 2016 marks Reich's 80th birthday and this new album pays tribute to the profound impact the composer had on contemporary music and on the ensemble's members. "When we formed Third Coast Percussion ten years ago, it was inevitable that Reich's work would be part of our repertoire. Each of us could recall formative artistic experiences with this music that had helped lead us toward lives of championing the modern," says Robert Dillon of Third Coast. "Before we had come to fully appreciate Pierre Boulez or George Crumb, we discovered through Reich that music built on an utterly different paradigm could prove deeply rewarding for performers and audiences alike. Reich's music has similarly inspired our field as a whole. While most composers now welcome our instruments on the concert stage, only a few have shown audiences how percussion can be absolutely essential. The rhythmic drive, articulated melody, and perpetual cycle of Reich's music seems to have marimbas and vibraphones in its very DNA." In conjunction with the album's release, Third Coast Percussion will embark on a multi-city U.S. tour in winter and early spring 2016. New England Conservatory announced this week that world-renowned cellist and educator, Lluís Claret has been appointed to its faculty. Born in 1951 in Andorra la Vella to exiled Andorran parents, Lluís Claret began his musical studies at the age of nine. In 1964 he moved to Barcelona, Spain, where he won major distinctions at the Conservatory of the Liceu and began working with Enric Casals. He continued his studies in France, Italy and in the USA with masters such as Maurice Gendron and Radu Aldulescu. Claret has said that his personal meetings with György Sebök, Eva Janzer and Bernard Greenhouse were also implemental in the development of his artistic personality. 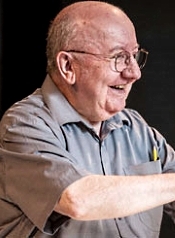 Claret's professional career was launched into the international spotlight after he took first prizes at the Pablo Casals International Cello Competition in 1976 and the Rostropovich Cello Competition in 1977. Chamber music, pedagogy and a great interest in contemporary music are all essential elements of Claret's musical focus. His previous teaching posts include the "Victoria dels Angels" Music School at Sant Cugat in Barcelona, Spain and the Toulouse Conservatory in Toulouse, France. He currently teaches at the Conservatori Superior de Música del Liceu in Barcelona, Spain and has presented master classes in France, Portugal, Belgium, Italy, the U.S., Japan and Korea. Claret also conducted seminars at the Abbey of Fontfroide in Narbonne, France with Bernard Greenhouse. New England Conservatory's Interim President, Tom Novak discussed Claret's new appointment. "We are very pleased to have Lluís Claret join the faculty at NEC," said Novak. "His distinguished teaching and performing career is a wonderful complement to the existing cellists on the faculty, and we look forward to his presence at the Conservatory next year," he said. The Orion Ensemble, winner of the prestigious Chamber Music America/ASCAP Award for Adventurous Programming, continues its 2015-16 season with a program highlighting American composers, "American Landscape," showcasing its esteemed ensemble musicians: clarinetist Kathy Pirtle, violinist Florentina Ramniceanu, cellist Judy Stone and pianist Diana Schmück. Performances take place at First Baptist Church of Geneva March 13; the Music Institute of Chicago's Nichols Concert Hall in Evanston March 20; and the PianoForte Studios in downtown Chicago March 23. Rick Sowash's "Anecdotes and Reflections: A Portrait of America" for clarinet, violin, cello and piano (1988-89) is a work of pointed rhythms and fanciful melodies, with a masterful blending of the four instruments. Orion performs two movements from this work that run the gamut of musical influences, from spirituals to Sousa-style marches, from Dixieland to Eastern European/Klezmer music. One of Dvorák's finest chamber works, his Trio in E Minor, Op. 90 for violin, cello and piano (Dumky) was written in 1891 and featured in his 40-concert farewell tour before he took over leadership of the National Conservatory of Music of America in New York City. In classical works, the term "Dumky" means music that traverses many emotional expressions; from triumphant to melancholy, the music can change in an instant. In the opening of this work, cello and piano play a mystical duet, giving way to a yearning violin solo that in turn begins a round between the players as we are then swept away to the equally enchanting main theme. Philharmonia Baroque Orchestra & Chorale (PBO) is pleased to announce Nicholas McGegan's 30th Anniversary Gala and Concert on Thursday, February 11, 2016. The evening will take place at San Francisco's City Hall with a special Gala concert at Herbst Theatre featuring star mezzo-soprano Susan Graham. The celebratory Gala will recognize Nicholas McGegan's extraordinary artistic contributions to the Bay Area and beyond. The evening will unfold with an elegant cocktail party and silent auction in San Francisco City Hall's dramatic Rotunda, followed by a formal sit-down dinner by McCall's and live auction in the Northlight Court. Immediately after dinner, guests will be ushered to the Herbst Theatre across the street for "Baroque Fireworks," a special performance by Nicholas McGegan and Philharmonia Baroque Orchestra featuring critically-acclaimed mezzo-soprano Susan Graham in a program of Handel arias. Following the concert, guests will return to City Hall for the Afterparty, which will include an elaborate dessert reception, scotch tasting, and jazz. The 30th Anniversary Gala Committee is chaired by Paul Sugarman. Generous sponsors include Official Gala Sponsor Ross E. Armstrong, Corporate Sponsor Bailard/Eric Leve, and Dinner Sponsors Mark Perry and Melanie Pena. PBO's Official Wine Sponsor is WineWise/Hiram Simon & Brian Greenwood. Happy New Year! For many, the beginning of a new year presents the opportunity for a fresh start and perhaps a new set of goals. One common resolution is, of course, to focus on fitness. Joining a gym or exercise class is certainly worthwhile, but how about giving Bach a spin? Adding more J.S. Bach to your life during 2016 just might be the recipe for a "new you" in the year ahead. ABS is here to help! We have a wonderful season of works by J.S. Bach ahead, beginning January 22-25 with "Bach Favorites," a balanced program of two extraordinary cantatas from the composer's first year in Leipzig and two virtuosic works for violin featuring the 2016 Jeffrey Thomas Award recipient, Tatiana Chulochnikova. American Bach Soloists created the Jeffrey Thomas Award in 2013 to honor, recognize, and encourage exceptionally gifted emerging professionals in the field of early music. In tandem with a cash prize, recipients are invited to perform with American Bach Soloists, and ABS audiences have enjoyed the opportunity to hear tenor Guy Cutting in Bach's Magnificat and violoncellist Gretchen Claassen in a concerto by Leonardo Leo. This month the 2016 recipient of the award, violinist Tatiana Chulochnikova, will hold the spotlight in two thrilling showcases for her dazzling technique and bravura style: Bach's Violin Concerto in E Major and her own violin transcription of the famous Toccata & Fugue in D Minor. We asked Chulochnikova about her violin, her love of playing the music of Bach, and the upcoming program, Bach Favorites. 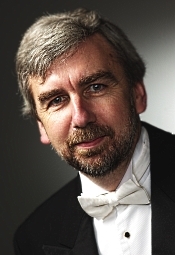 Andrew Penny, National Symphony Orchestra of Ireland. Naxos 8.552001. Twentieth-century English composer Sir Malcolm Arnold (1921-2006) wrote a multitude of film scores (The Captain's Paradise, Hobson's Choice, Trapeze, Island in the Sun, The Bridge on the River Kwai, etc. ), and as a result people often think of him only as a composer of light music. But his nine symphonies and many overtures and marches show us a musician who could move from the serene to the rollicking and from the sublime to the ridiculous in grand fashion. Arnold was a kind of throwback to another era, a Romanticist in the Modern Age, a man whose music could be serious but never self-righteous. That said, the two symphonies recorded here represent Arnold's more earnest and more darkly creative side. The Seventh Symphony (1973) opens with a long, colorful, somewhat rambunctious, and vaguely ominous movement that makes us wonder where its sudden jazz infusion comes from. It turns out it's a leftover from Arnold's Sixth Symphony, just one of many connections his admirers make in showing the coherence of the man's complete symphony cycle. The second movement comes out of left field with a beautifully evocative mood, followed by an odd, cantankerous finale. The fact that most of it holds together so well is a tribute to the composer's musical imagination and skill. The much shorter Eighth Symphony (1978), about twenty-five minutes, is probably more characteristic of the man. It's sprightlier and more optimistic, although it, too, finds room for odd, sometimes discordant tones. 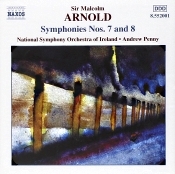 Listeners have enjoyed its Irish march as well (which originated in one of the film scores Arnold wrote), the music itself probably a result of Arnold's having lived in Ireland for a while. Maestro Andrew Penny and the National Symphony Orchestra of Ireland perform both works in precise terms, leaning heavily to clarification rather than overt dramatics. It's probably the best way to perform the music, leaving the histrionics to the scores themselves without unduly emphasizing them. The results are as felicitous as one could desire. The Naxos engineers provide a clear, true sound for the 2001 recording. The clarity does come at the expense of a small degree of brightness, however, that some playback systems may tend to exacerbate. The recording also provides a good separation of instruments, but one could also interpret this as a degree of compartmentalization. In any case, I enjoyed the disc's sonic character, especially its lucidity, because it seems to me that Arnold's music benefits from an extra bit of illumination. In all, we get a pleasant and in some ways stimulating musical coupling, framed in clean, modern digital sound, and costing a relative pittance. Interesting stuff. Also, Tartini: Violin Sonata in G-minor; Leclair: Violin Sonata in D. James Ehnes, violin; Andrew Armstrong, piano; Sydney Symphony. Onyx Classics 4134. There must be more recordings of Vivaldi's Four Seasons than there are leaves in the autumn wind. And they already come in every variety imaginable, from chamber orchestras to large ensembles, from period instruments to modern. In order for a new recording of the Seasons to make any impression at all, it has to have some unique characteristic going for it. A recently unearthed original manuscript perhaps; a new transcription for accordion or flugelhorn; or a performance by a noted soloist. 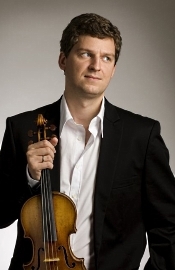 In this case, it's a noted soloist: the Canadian concert violinist James Ehnes, who has over three dozen albums to his credit. The next question is whether even a noted soloist can do anything different with the music. In this case, I'm not persuaded. Ehnes is a fine violinist, and he gives it his best shot. But, frankly, the results don't sound much different from a hundred other interpretations of the music. Which is not to say there is anything wrong with Ehnes's performance. It's quite good, in fact. It's just that there are so many other competing versions that offer something a little more in the way of imagination, zip, energy, brilliance, subtlety, nuance, sound, or what have you. Anyway, as you doubtless know, Italian composer, violinist, and Catholic priest Antonio Vivaldi (1678-1741) wrote The Four Seasons as a part of a longer work, Il cimento dell'armonia e dell'inventione, "The Contest between harmony and invention." Vivaldi's publisher released them in 1725, a time when the musical world was little used to music representing the sights and sounds of the environment around them. Vivaldi's little three-movement concertos were complete with the musical sounds of chirping birds, galumphing horses, barking dogs, dripping icicles, howling winds, and the like, meaning for them to accompany descriptive sonnets. The music became among the first and probably most-famous tone poems ever written. Even though the sonatas appear first on the present disc's program, I listened to the concertos before anything else. Here, Ehnes, leading players from the Sydney Symphony, impressed me with his levelheaded approach to the music. It is neither dizzyingly fast nor mind-numbingly slow. I suppose a lot of Vivaldi fans will find it lacking the excitement of, say, Fabio Biondi and his Europa Galante, yet its moderate tempos seem properly judged. What's more, the cushy, comfortable sound of the Sydney players helps make the music appear less abrasive than it can sometimes sound. Indeed, almost everything Ehnes does here seems well judged, from the pacing to the early musical impressionism. However, what struck me most was Ehnes's handling of the concertos' slow movements. The violinist's manner is elegant and graceful, the slow movements especially fluid and refined. And it's not that Ehnes doesn't whip up a requisite degree of excitement elsewhere, either; a listen to his handling of the contrasting elements of the allegros proves that. It's just that there is a delicacy about the largos and adagios that sounds quite charming. 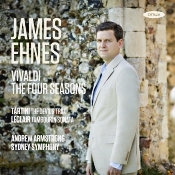 Ehnes plays with a consummate skill and virtuosity, and his Sydney ensemble provide him a warm, comfortable accompaniment. One can only admire the musicianship throughout. Would I recommend Ehnes, however, as a first choice in this repertoire? Probably not because I still think folks like McGegan (PBP), Kuijken (Sony), Sparf (BIS), Pinnock (DG Archiv), Lamon (Sony), Perlman (EMI or Hi-Q), Marriner (Decca), Silverstein (FIM or Telarc), Biondi (Virgin), Jansen (Denon), and I Solisti Italiani (Denon) among others have made more of these scores in terms of inventiveness. Nevertheless, Ehnes is a good middle-of-the-road possibility for those music listeners who want something a little more conservative yet still highly musical and satisfying. Accompanying The Four Seasons, we find the Violin Sonata "Il trillo del diavolo' in G minor by Italian violinist and composer Giuseppe Tartini (1692-1770) and the Violin Sonata 'Tambourin' in D by French violinist and composer Jean-Marie Leclair (1697-1764). Maybe because I was so much more familiar with the concertos and had heard them so often over the years, I found these sonata couplings more to my liking. Ehnes displays a gentle and persuasive touch and Andrew Armstrong a calm, temperate accompaniment, making these works enormously enjoyable. Producers Simon Kiln (Tartini and Leclair) and Philip Powers (Vivaldi) and engineers Mike Clements (Tartini and Leclair) and Bob Scott (Vivaldi) recorded the music at Potton Hall, Westleton, Suffolk UK (Tartini and Leclair) and Angel Hall, Sydney, Australia in May and October 2014. The sound in the concertos is a bit forward but quite clear. Although the somewhat close-up miking and the slight upper-midrange brightness may be little distracting for some listeners, one cannot deny they help immensely in terms of detail and transparency. There isn't a lot of dimensionality front-to-back, either; still, the left-to-right stereo spread sounds realistic, and the whole enterprise appears brilliantly and cleanly alive. The sound in the sonatas is warmer than in the concertos, the two instrumentalists appearing quite natural in terms of overall frequency balance and their environmental setting. No complaints here. The Chicago Gargoyle Brass and Organ Ensemble will give the world premiere of a new arrangement of Benjamin Britten's evocative "Four Sea Interludes and Passacaglia" from his dramatic opera Peter Grimes at concerts at 4 p.m. on Sunday, February 21, at First United Church of Oak Park, 848 Lake St, Oak Park, Ill.; 7:30 p.m. on Friday, March 4, at First Congregational United Church of Christ, 256 Chicago St., Elgin; and 4 p.m. on Sunday, March 6, at St. Michael Catholic Church, 310 S. Wheaton Ave., Wheaton, Il. Admission to the Elgin and Wheaton concerts is free to the general public. 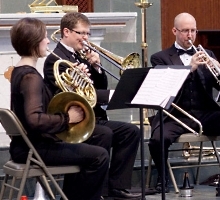 Tickets to the Oak Park performance can be purchased through the ensemble's website, gargoylebrass.com. The arrangement, commissioned by the professional chamber ensemble and written by Craig Garner, is based on Britten's own, widely performed orchestral version of the same music, which mirrors the plot and setting of a tragic story that unfolds in an English seacoast village. The Gargoyle's nautical-themed concert program, titled Seascapes: Music from Britten's Peter Grimes, will include the world premiere of another newly commissioned arrangement: Garner's "Suite from Water Music," based on G. F. Handel's popular baroque masterpiece. "Listeners will experience a deluge of water-themed delights," says Rodney Holmes, artistic director of Chicago Gargoyle Brass and Organ Ensemble. In addition, the program will offer Claude Debussy's French impressionist "La cathédrale engloutie" (The Sunken Cathedral), written for and performed on solo piano; and the "Russian Sailor's Dance" from Reinhold Glière's ballet "The Red Poppy." Concertgoers will also hear Britten's "Fanfare for St. Edmondsbury," Vaughn Williams' "Two Preludes for Organ" ("Bryn Calfaria" and "Rhosymedre"), and Michael Burkhardt's organ and brass arrangement of the hymn "You Call Us, Lord, to Be," based on a Welsh folk tune. Single tickets for the February 21 concert in Oak Park are $15 adult general admission and $10 for students. Tickets are available at garoylebrass.com or by calling 800-838-3006. No tickets are required for the March performances in Elgin and Wheaton, which are free to the general public. His death was confirmed by his family in a statement to the Philharmonie de Paris. Prime Minister Manuel Valls, also in a statement, said, "Audacity, innovation, creativity — that is what Pierre Boulez was for French music, which he helped shine everywhere in the world." Mr. Boulez belonged to an extraordinary generation of European composers who, while still in their 20s, came to the forefront during the decade or so after World War II. They wanted to change music radically, and Mr. Boulez took a leading role. His "Marteau Sans Maître" ("Hammer Without a Master") was one of this group's first major achievements, and it remains a central work of modern music. He reached his peak as a conductor in the 1960s, when he began to appear with some of the world's great orchestras, including the Concertgebouw in Amsterdam, the Berlin Philharmonic and the Cleveland Orchestra. His style was unique. He never used the baton, but manipulated the orchestra by means of his two hands simultaneously, the left indicating phrasing or, in much contemporary music, counterrhythm. The tasks he took on were heroic: to continue the great adventure of musical modernism, and to carry with him the great musical institutions and the widest possible audience. The Mirror Visions Ensemble, comprised of soprano Vira Slywotzky, tenor Scott Murphree, and baritone Jesse Blumberg together with pianist Grant Wenaus, will perform Flights of Fantasy on Saturday, January 23 at 5:00 p.m. at the Roeliff Jansen Community Library in Hillsdale New York, on Sunday, January 24 at 2:00 p.m. at the Druker Auditorium at the Newton Free Library, and on Saturday, January 30 at 2:30 p.m. at the New York Public Library for the Performing Arts. The program explores themes of deities, nymphs, enchanted forests, beasts, and charms through works by composers such as Debussy, Gershwin, Mendelssohn, and Schubert, as well as a premiere by Gilda Lyons and a Mirror Visions commission by Russell Platt. Tickets for each performance are free and distributed on a first-come, first-served basis. The National Philharmonic, led by Music Director and Conductor Piotr Gajewski, will feature concertmaster Colin Sorgi in a performance of Bach's Violin Concerto No. 2 in E Major on Saturday, January 16 at 8 pm at the Music Center at Strathmore. A free pre-concert lecture will be offered in the Concert Hall at 6:45 p.m. on Saturday. Tickets start at $29 and are free for children ages 7-17 FREE through the ALL KIDS, ALL FREE, ALL THE TIME program. ALL KIDS tickets must be reserved by calling (301-581-5100) or visiting the Strathmore Box Office. Parking is complimentary. Strathmore is located at 5301 Tuckerman Lane, North Bethesda, MD 20852. For more information or to purchase tickets, go to www.nationalphilharmonic.org or call 301-581-5100. Three young musicians joined forces more than 25 years ago to play chamber music. All moved on to illustrious careers: Jeffrey Kahane as Music Director of the Los Angeles Chamber Orchestra, and world famous pianist, Joseph Swenson as Conductor Emeritus of the Scottish Chamber Orchestra, and Carter Brey as Principal Cellist for the New York Philharmonic. Now reunited, they wow audiences with their impassioned interpretations of chamber literature. Sat, Jan 16 at 7:30 pm | Weill Hall, Sonoma State University. MasterCard Performance Series. NPR calls this sweet-voiced lyric tenor, "an artist who must be heard." He teams up with Myra Huang, a pianist who Opera News hails as "among the top accompanists of her generation." Sun, Jan 17 at 3 pm | Schroeder Hall. These two legends of Latin music continue to thrill audiences. Ten-time Grammy Award-winning pianist and bandleader Eddie Palmieri is the acknowledged inventor of the salsa sound. Opening the show is master stickman Pete Escovedo who, like Palmieri, has spent decades fusing Latin, jazz, soul and funk into a new sound world. Two shows. One amazing night. Sat, Jan 23 at 7:30 p.m. | Weill Hall. MasterCard Performance Series. Robert Huw Morgan is the University Organist at Stanford University, a position he has held since 1999. A native of Wales, he received his BA and MA from Cambridge University and in 1989 became a Fellow of the Royal College of Organists. Sun, Jan 31 at 3 pm | Schroeder Hall. It is with great pleasure that we announce to you today that from 2016, Mitsuko Uchida will join the Mahler Chamber Orchestra as one of our Artistic Partners. In their own individual ways, our Artistic Partners inspire and shape the orchestra over multi-year, large-scale projects. With Mitsuko Uchida, one of the greatest Mozart interpreters of our time, we shall in particular be exploring Mozart's piano concertos, which Mitsuko Uchida will lead from the keyboard. We warmly invite you to join us on this journey over the coming years; in January alone, you have the opportunity to do so in four different countries. Fort Worth Opera will premiere the third installment of The Making of An Opera -- a multi-part documentary series detailing the creation of David T. Little and Royce Vavrek's world premiere opera JFK -- in a special, free evening of film, games, prizes, and cocktails. The video release party is open to the public and FWOpera invites opera, film, and music lovers to experience JFK on the big screen as we view the first two installments, The Discovery and The Libretto, before unveiling the newest video, The Music. Complimentary food from On the Border will be provided and a cash bar will be available for guests. Tickets for this event are free, but RSVPs are strongly encouraged. Reserve your seat registering at https://www.eventbrite.com/e/the-making-of-an-opera-release-party-tickets-19952250719. JFK premieres on Saturday, April 23, 2016 as the headlining opera of the 2016 FWOpera Festival. 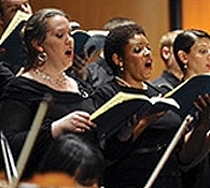 Thursday, January 14, 2016 | 6:30 p.m. to 9 p.m.
Two Sensational Cantatas by Bach: "Wachet! betet! betet! wachet!" and "Herz und Mund und Tat und Leben," with performances by the 2016 Jeffrey Thomas Award Recipient, Tatiana Chulochnikova. Ivan Fischer, Budapest Festival Orchestra. Philips 289 464 640-2. Clearly, the years have jaded me. Any recording of something so popular as Dvorak's "New World" Symphony has to be pretty special to make a dent in my well-established hierarchy of favorites. 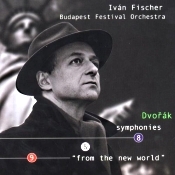 I'm afraid that even so distinguished a crew as Ivan Fischer and his Budapest Festival Orchestra couldn't quite do that, although they give it a good shot. Fischer's 2001 Philips release of the Ninth goes along without a snag; fact is, I can't fault it on much of any grounds. My hesitation in fully recommending the disc is that if you compare it to the company of Kertesz (Decca), Kondrashin (Decca), Reiner (RCA), Horenstein (Chesky), Macal (EMI Classics for Pleasure), Neumann (Denon), Kubelik (DG), Davis (Philips), and others, Fischer sounds somewhat ordinary. The performance is not without spirit, however, and one cannot complain about its not being lyrical enough or even thrilling enough. Indeed, Fischer handles the slow movement as beautifully as anyone I've heard. Yet maybe he overdoes things a bit, trying too hard to inject moments of excitement where a more steady hand might have sufficed. What's more important, though, is that Fischer's interpretation of the accompanying Eighth Symphony is even more invigorating than his Ninth. Indeed, if it weren't for price (and I'd say availability, too, now that Philips is no more, but I believe both Decca and Channel Classics have revived it, in SACD, too), I'd recommend this disc for the latter piece alone. In the Eighth Symphony Fischer persuasively captures the feelings both of bucolic warmth and of native Czech flair. It's a lovely reading. Nor can I say too much against Philips's sound, which is warm, spacious, and natural throughout. Yet I find it difficult to find anything about the sound to praise over its rivals, either, the rivals themselves either warm and natural or in most cases more detailed and more brilliantly alive, as well. The Philips sound for Fischer is a bit underwhelming at the high end and a bit lower-midrange heavy at the other extreme. A little more treble openness would have probably given the music a better spit-and-polish. Doubtlessly, the two most important factors this disc has going for it are that it seems more than competently performed, and it pairs two of Dvorak's most famous compositions. Nevertheless, I would remind the reader that Philips had also issued a two-disc, mid-priced set of all three late Dvorak symphonies under Sir Colin Davis, excellent renditions in excellent sound and probably still available somewhere. Now, for value, that's a hard act to beat.